Dental Health and Diet – Open Up and Say Health! Proper nutrition means eating a well-balanced diet that allows your body to get the nutrients necessary for good health. If your diet does not include sufficient vitamins and nutrients, your mouth may have a more difficult time resisting infection and may become prone to other oral problems as well. This may contribute to periodontal disease, and worse. In this post we’ll will introduce you to some foods that can be included in your diet to help you achieve optimal oral and general health. Gums are the unsung hero of your mouth. Along with the jawbone, they keep your teeth in place, they protect your oral bones, and they fight a ceaseless battle against bacteria. Which is why we should be careful to not only focus on supporting our teeth – we also need to remember to take care of our gums. And one simple way to make sure your gums and teeth are getting the healthy support they need is by eating well. 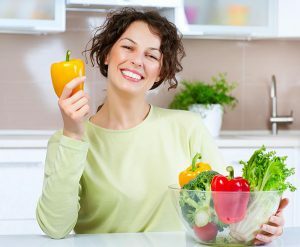 Read on to learn more about foods that you can easily incorporate into your meals to improve the state of your teeth and gums. Leafy greens. Vegetables including kale and spinach overflow with mouth-healthy vitamins and minerals. They contain vitamin C, which boosts red blood cell production and fights inflammation. Leafy greens also require more chewing that some other foods, thanks to their high fibre content. This is good for gums because the chewing action creates more saliva and the vegetables themselves can loosen food particles, bacteria, and plaque that may be sticking to your teeth near the gum line. Some of these foods also clean between the teeth. So, add greens to your diet as salads, cooked side dishes, and as ingredients in soups and sandwiches. Onions. Onions have microbial properties that target the most common types of bad oral bacteria. To support your gums, mix more onions into your meals as salad garnish, in sandwiches and burgers, in stir-fries, and in soups, stews, and chilis. Of course, onions can have a distinctive smell, so if you are prone to halitosis, you might need to brush after eating them! Green tea. A study that examined the dental health of 940 men found that those who regularly drank green tea had better oral health than those who didn’t. Men between the ages of 49 and 59 were examined on three indicators of gum disease, and researchers found that for every cup of green tea consumed per day, a decrease in all three indicators occurred. Do be aware, however, that green tea can stain your teeth, so keep your brushing and flossing up to enjoy the dental advantages of tea without any of its downsides. Peppers and citrus fruits. Once again, we’re dealing with our old friend Vitamin C. Vitamin C is present in high levels in peppers of all colours and acidic fruits such as oranges, kiwis, pineapple, and strawberries. Add these fruits to your diet to gain the benefits of this anti-inflammatory vitamin. These fruits can be served in smoothies, with yogurt, or in salads. Or, just chew on them raw. As a warning, the citric acids in some of these vegetables can attack your teeth, so, as usual, keep on brushing after those meals and snacks! Celery, carrots, and apples. Crunchy foods are excellent at scraping away stuck on food and plaque through the mechanical action of chewing. The hard fragments of foods like celery, carrots, and apples get in between teeth and into tooth crevices and, acting something like dental floss, help keep your mouth fresh between brushings. Crunchy fruits and vegetables also happen to be high in fibre, which, again, means they take longer to chew and generate more healthy saliva. These hard foods are extremely portable, so they are excellent snacks for gum and teeth health. Milk, yogurt, and cheese. Dairy products are good for teeth because they contain calcium, a mineral that helps to strengthen bone. But as a bonus they are also great for your gums. A protein called casein is found in most dairy products, and this protein neutralizes oral acids produced by oral bacteria. These acids can be harm tooth enamel and gum tissue. Include dairy in your diet by drinking a cup of milk daily or by eating snacks that include dairy such as cheese or yogurt. Be aware that some dairy products come with high levels of sugar (like flavoured milk, and ice cream), which can be bad for teeth.